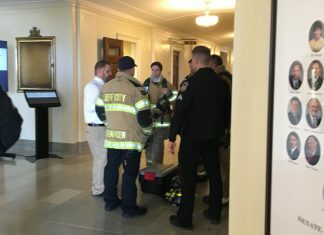 According to a statement from the Missouri Senate leadership, an unknown substance was delivered in an envelope to a senator’s office on Wednesday, April 18. The substance, described as green and powder-like in nature, was sent to Sen. Maria Chappelle-Nadal. She told the Senate on Thursday that it had arrived in the Senate mail room through the U.S. Postal Service, but did not have a return address. She also noted that it was not the first threat she has received, saying that she has received a larger number of threats within the past six months, following her comments about President Donald Trump. Chappelle-Nadal said the first thought that she had after being informed was about the children that could have been exposed. However, preliminary tests say everything is ok and that the substance was not harmful. “We wish to thank local first responders and members of law enforcement for their quick reaction to the issue. Early analysis indicates the substance is not harmful and does not present a threat to anyone in the building; however, we are extremely thankful that they continue to monitor the situation in order to guarantee our protection and safety,” Richard and Kehoe’s statement read. The substance has since been removed from the Capitol, and the three offices (the mail room, Sen. Chappelle-Nadal’s office, and the Senate administrator’s office) will be closed until further tests are completed.